The siren has sounded to end Q4. Hawks InterchangeLiam Shiels and is possibly out for the game. 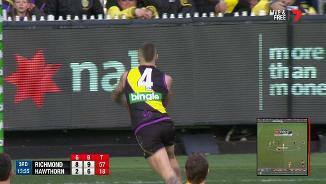 Richmond has scored five of their 12 majors from within 15 metres of goal. In contrast, Hawthorn has only kicked one of their seven from this close a distance. Tigers InterchangeCorey Ellis off due to the blood rule. Over the past five weeks, the Hawks have averaged 36 more disposals per game than their opposition, the best differential recorded in the AFL in that time. This has not held true today, where the Tigers hold the edge in the disposal count, 355 to 340. Josh Caddy has not kicked three goals in a game since he did in round one last year while wearing the blue and white hoops of Geelong. That day the opponent was also Hawthorn. 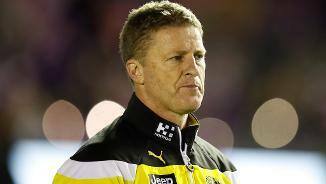 Josh Caddy has gained a matchleading 459 metres for Richmond. Next best in the game is his Tiger teammate Kane Lambert with 423 metres gained. 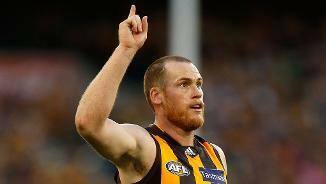 Taylor Duryea is the only Hawk to have played 100 per cent game time today. For Richmond, key defenders David Astbury and Alex Rance have both also not seen spent any time on the interchange bench. The siren has sounded to end Q3. Only two players on the the ground have multiple contested marks today. 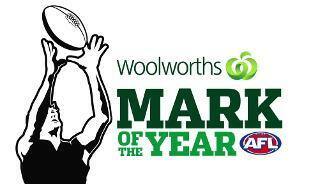 Richmond's Dustin Martin and Hawthorn's Ryan Burton have each taken a couple. The spoil count favours the Tigers 31 to 15, with Astbury, Rance and Broad each responsible for five. Four each of Astbury's and Rance's spoils have gone to the direct advantage of a teammate. Richmond has produced three goals from their last four forays inside 50. The battle between number one rucks Nankervis and McEvoy is tied at 15 hitouts apiece. However, Hawk McEvoy holds a slight edge in hitouts to the advantage of a teammate, seven to five. Hawks InterchangeJack Gunston off due to an injury. Daniel Howe's matchhigh eight tackles for Hawthorn already exceeds his season average of 5.1 across his previous 14 games in 2017. After 65 games in four seasons with the Sydney Swans, firstyear Hawk Tom Mitchell is producing a career-best 35.6 disposals per game in 2017. He leads all players at the MCG today with 21 first-half disposals at 81 per cent efficiency. The siren has sounded to end Q2. 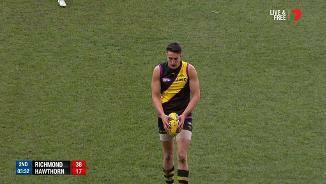 Ivan Soldo produces his first career score with a goal in his sixth AFL game for the Tigers. After giving away ten free kicks in the first term, Hawthorn has been able to limit this figure to two so far in the second. A Kamdyn McIntosh clearance for the Tigers broke a run of five straight for Hawthorn. The Hawks have 41 disposals at 68 per cent efficiency so far in the second term, far superior to Richmond's 21 disposals at 52 per cent. Dustin Martin has won first possession at a centre bounce 22 per cent of the time this season, the highest percentage of the top10 centre bounce clearance winners. However, so far today he has zero centre bounce first possessions or clearances. After kicking 2.0 in the opening term, Richmond's Corey Ellis has multiple goals in a match for the first time in his 22 game career. The siren has sounded to end Q1. Averaging careerhighs for disposals per game (16.8) and disposal efficiency (81.0 per cent) in his third AFL season, Hawk James Sicily already has ten disposals today at 90 per cent. The entire Richmond score of 3.2 has been sourced from a Hawthorn turnover. Hawthorn has just the five disposals in their forward 50 to this point, compared to 15 for the Tigers. Thirdgamer Teia Miles gets the Hawks first goal of the game and the first of his career. With the first goal today, Josh Caddy takes his season tally to 13 majors from 18 games. Since Round 10, Richmond captain Trent Cotchin has directed 77 per cent of his kicks short, the highest percentage of the top25 kick-getters in the competition. Since Round 10, the Hawks have won 36 per cent of their defensive oneon-one contests - the second-highest percentage recorded by a side in that time. Don't forget to enter your tips for this match, you have until the bounce to make your selection. Welcome to MCG for the Richmond v Hawthorn Round 20 clash. RICHMOND looks destined for a top-four finish and a double September chance after a 29-point win at the MCG on Sunday that all but ended Hawthorn's late finals surge. The Tigers passed another significant test on their way to their fourth straight win, producing one of the most even performances of their season against the in-form Hawks to win 13.15 (93) to 9.10 (64) and move clear in third spot. 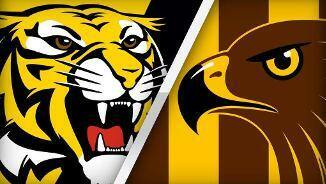 The win sets up a mouthwatering top-four showdown against Geelong next Saturday, which could see the Tigers – who have won five of their past six – all but cement their first double chance since 2001. Hawthorn, meanwhile, looks set to miss the finals for the first time since 2009 and just the second time in 11 years, with the Hawks falling to 13th on the ladder with three rounds to play. The loss soured captain Jarryd Roughead's 250th match in what has been a triumphant return to the game in 2017, with the champion forward chaired off the ground through a guard of honour. 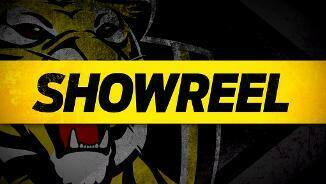 The absence of Jack Riewoldt in an already undersized forward line could have proved too much for the Tigers on Sunday, but it was just another hurdle they leapt over in a season that is building nicely. Josh Caddy was brilliant with a career-best four goals, holding down a deep forward role and finishing with 28 possessions, six inside 50s and nine marks in his best game for the club. Fellow recruit Dion Prestia also played the best game of his season after a one-week rest, winning a game-high eight clearances and 31 possessions, showing how valuable he could be at the pointy end of the season. Dustin Martin (32 possessions and two goals) spent long periods forward, particularly after he was dumped in a heavy tackle in the third quarter, with Prestia becoming the midfield architect. He was well supported by Kane Lambert (30 and eight inside 50s), while the typically rock solid backline hardly faltered, keeping the Hawks to 4.8 in the first three quarters before the Hawks rattled on five goals in the final term. "I was happy our boys started well. 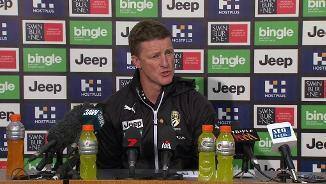 We knew they were a fast-starting side, and our guys came to play early," coach Damien Hardwick said. "There are a lot of sides thankful for us beating them, because they were coming and playing those guys in September is a bit of a concern, so it was a good win." The Hawks were well-served by prolific midfielder Tom Mitchell (35 possessions) and James Sicily, who controlled the airwaves in defence with 29 possessions, 10 marks and seven rebounds. 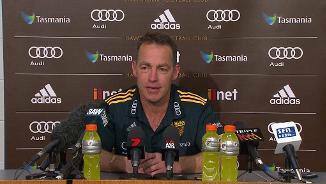 Coach Alastair Clarkson said his team simply lacked "the polish and hardness" of the Tigers, who repeatedly punished them on the turnover, with fumbles and errors by hand proving costly. "They're as good as any side in the competition at making you pay on the turnover and getting open goals," the coach said. 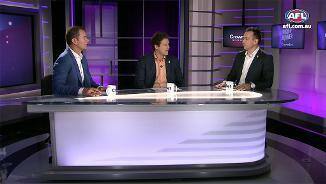 "I think of their 13 goals, nearly seven or eight of them were goalsquare goals and that's a reflection of just how easily the ball moves from one end of the ground to the other. "Our goals were so hard to come by. We worked hard through the course of the game, but we just didn't have that polish and hardness in close that Richmond demonstrated tonight and it probably cost us the game." Richmond made sure nothing was easy for the Hawks, bringing swarming tackle pressure in the first quarter and feasting on their opponents' turnovers with quick counter-attack football. Bombing the ball inside 50 was going to be a recipe for disaster without Riewoldt, but it was clear from the start the Tigers had a plan and they picked apart a Hawthorn backline that was in disarray without suspended champion Luke Hodge. They dominated for long periods without getting reward, kicking just one goal in the second quarter from nine inside 50s, but they put their foot down in the third, kicking four goals to one in a match-winning burst. Percentage will be crucial for the Tigers in the run to September and conceding five goals in the final term was the only sour note as they moved level on points with second-placed Greater Western Sydney. Richmond: Corey Ellis copped a knock to the nose and was patched up in the rooms post-match, but the Tigers suffered no significant injuries. Martin was put down in a heavy tackle in the third quarter and took some time to shake it off, but was fine to play on and kicked two quick goals soon after. Hawthorn: Jack Gunston came to the bench in the third quarter to have his left pinky finger attended to but played on with it taped. The Hawks had no other concerns. Richmond has an opportunity to stamp its premiership credentials against a Geelong team next Saturday that will be missing injured captain Joel Selwood. The Tigers haven't played at Simonds Stadium since 2012, with their last win at the venue coming in 2006. Hawthorn faces North Melbourne in Launceston in the final match in Tasmania for the season.